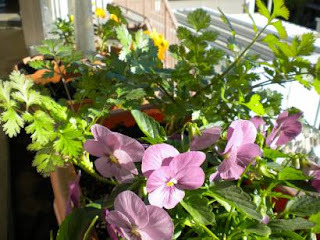 My pots are now full of chrysanthemums blooming purple and gold, while a series of violas, a.k.a. Johnny-Jump-Ups turn their smiley little faces to the sun. Their yellow and blue and purple and gold blooms make a cheerful addition to our salads, as well, which is again a pleasant surprise. In Michigan, salad flowers are only a summer pleasure. Here, it seems, they may just be a fall and winter one. Parsley and cilantro are both doing well, but the latter seems to really be enjoying itself. We've been adding its leaves as well to our salads, but also to soups and eggs. The flavor is strong and unique, and not always favored by everyone. Word has it that the Japanese in particular don't enjoy it, but so far I've heard no complaints nor seen any left on plates. Most people seem to even take seconds. Maybe I've just got the proportions right? The pots this time around contain a mix of purchased compost and a scattering of composted chicken manure. I purchased both at a home improvement store not too far away. I managed to bring them home in my bike baskets, but it's no easy feat to ride with a 20 liter bag in the front and back. Each time I also had to fit in a plant or two I spotted on sale that I couldn't resist! I also had to relearn a lot about pots in here. The different climate sure makes things very different, but is all a great experience so far. I totally agree, Fer. It's been great, and I like that I still have so much to learn. Your blog is a big help, too!